This is a robust and complicated feature in Project Insight that allows Administrators to set who can see other users. By default the group All Authenticated Users is set to communicate with All Authenticated Users. This means every user sees every other user when selecting users from within various sections of Project Insight (i.e. Directory, Add Resources to Projects, etc.). Communication limitations can be set at the group, company or user level. When restricting communications rules, always set Group or Company settings instead of setting communications on a user-by-user basis. User level settings are only for use in very specific communication settings requirements for unique scenarios which can normally be avoided. 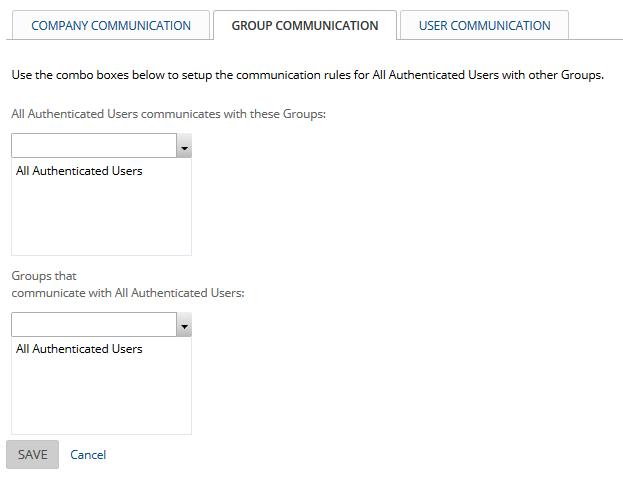 Select the Group Communication tab from within the All Authenticated Users Group communications editing. Use the communication assignments function to change the settings. If your Customers or Vendors are Project Insight users and you do not want them to be able to see all other users' contact information in the My Directory section, you may change their settings. Your company asks customers to login to Project Insight. You want all of your internal company's users to see users in all other companies or any other user in the system, but you do not want users in any of your customer companies to see each other. Edit your company and check the box on the General tab marked "Enable company members to automatically communicate with all other companies"